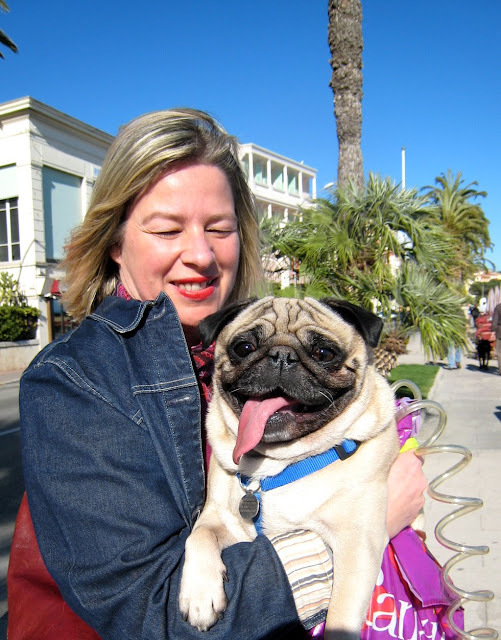 A hot day in Menton yesterday, and one hot pug. I didn't ask why his owner was carrying him but presumably cos he'd got hot - and pugs can have breathing problems if they get overheated. Look at that lovely lolling tongue! Gribouille, 4 years of age, lives in Castellar - a beautiful old village above Menton. Gribouille looks heavy for his nice owner to carry. Pugs are small but very solid little dogs. What wonderful characters they are. I've not seen a dog lead like that before - have you? What a happy looking Pug, he's just gorgeous! Ha ha! What a tongue. Pugs kill me. Oh yay!!! A pug, and a handsome one at that!